Like father, like son. Most people are familiar with Pro-Tech's Godfather knife, it's big, beautiful and powerful. The Godson is a smaller version of the Godfather with Italian inspiration and American innovation. The Godson features incredible coil spring action that is strong and lockup that won't let you down. This Steel Custom Protech Godson knife is a great collection piece. 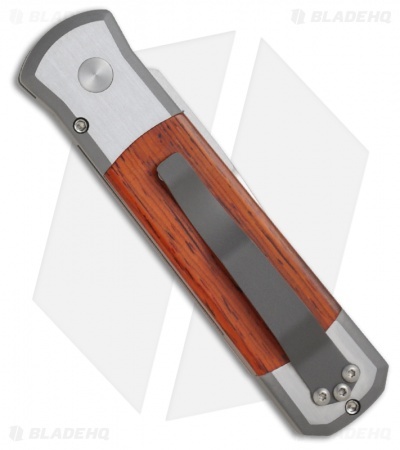 It features a 416 stainless steel handle frame with a two-tone finish; satin faces and bead blasted edges. The handle has beautiful Cocobolo wood inlays front and back. Firing button with mosaic insert and bead blasted titanium pocket clip. 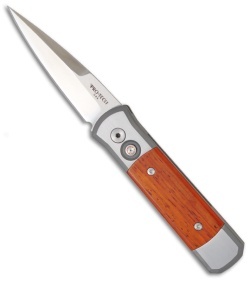 The satin finished blade is 154-CM stainless steel.